Beetroot is sliced into around inch long pieces and cooked in oil along with onion and whole spices. Basmati rice is added to the beetroot and cooked till done. Garnish with cilantro and serve yellow beetroot rice with any raita of your choice. Makes: around 4 Servings of Yellow Beetroot Rice. Peel, remove ends, wash and chop the yellow beetroot into inch long slices. Wash and soak the basmati rice in a cup of water for around half hour. Heat oil in a rice cooker, add all talimpu ingredients in order. When cloves are plump, add sliced onion and green chiles. Fry till onion turns translucent, add ginger garlic paste. Fry briefly, stir in beetroot pieces. When beetroot pieces are half cooked, stir in soaked rice along with water, coconut milk and salt. Cook covered till rice absorbs all the water and is completely cooked. Fluff the beetroot rice and adjust salt if necessary. 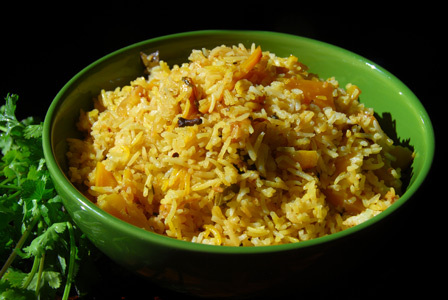 Garnish with cilantro and serve yellow beetroot rice with any raita of your choice. Notes: Grind grated coconut with warm water into smooth paste and run it through the sieve or a muslin cloth for the coconut milk. Suggestions: You can also use regular beetroot in place of yellow beetroot. Double the amount of whole spices if they are old stock. Variations: You can add finely chopped cilantro or mint just before serving. Other Names: Yellow Beetroot Rice. Beetroot is chopped and cooked in oil along with whole spices. Peanuts and sesame seeds are lightly roasted and ground into powder with spices and added to the beetroot curry as a finishing step. Serve beetroot curry with peanuts powder over plain steamed rice or wrapped in a roti. Makes: around 2 Servings of Beetroot with Peanuts Powder. Heat a pan on low heat, add raw peanuts and roast them till they turn golden brown on all sides. Remove the peanuts from heat, add sesame seeds. Toast the sesame seeds for few seconds and remove from heat. Heat 1/4 tsp of oil in the same pan, add broken red chiles and fry till aromatic or until they are crisp and turn dark. Cool the ingredients to room temperature. Grind roasted peanuts, sesame seeds, red chiles and salt into somewhat coarse powder. Peel, wash, remove ends and chop the beetroot into small pieces. Heat oil in a pan on medium flame, add all talimpu ingredients in order. When mustard seeds start spluttering, add beetroot pieces and salt. Cook covered on low flame for around 10 minutes or until beetroot turns soft but not mushy. Add a splash of water if the beetroot tends to stick to bottom of the pan. Uncover, stir in a tablespoon or two of ground peanuts sesame powder and remove from heat. Serve beetroot curry with peanuts powder over plain steamed rice or wrapped in a roti. Notes: Make sure beetroot is cooked properly. Suggestions: If the beetroot or chana dal is not cooked properly, add a splash of water and cook covered on low flame till done. Store any remaining peanuts sesame powder in a jar for later use. Variations: Check other beetroot recipes here. Other Names: Beetroot with Peanuts Powder. 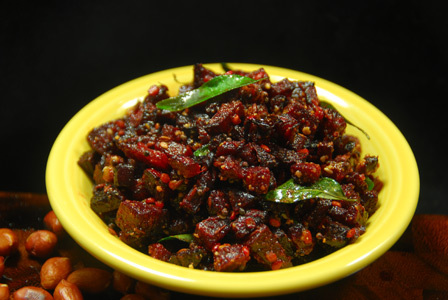 For quick beetroot rasam, spices are roasted in little oil. Beetroot is cooked and blended smoothly. The beetroot rasam is then boiled and seasoned with oil. Serve beetroot rasam with steamed rice and dollop of ghee. 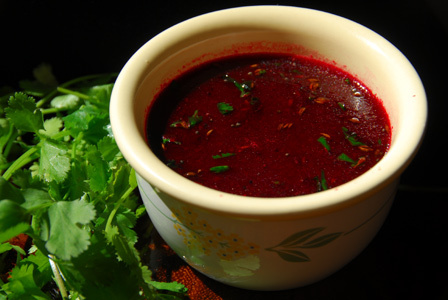 Makes: around 1 Cup of Beetroot Rasam. Peel, remove ends, wash and roughly chop the beetroot. Bring to boil 2 cups of water to a boil in a sauce pot. Add chopped beetroot, tamarind and boil till beetroot softens. Using a hand mixer, blend the beetroot into smooth paste. Put the pot back on heat, season with salt. Heat oil in a pan on medium heat, add all other talimpu ingredients in order along with garlic. When mustard seeds start spluttering, remove from heat, add cilantro to oil and immediately pour the spices into rasam pot. Mix well and give it a quick bubble after adjusting the consistency with water. Remove from heat and serve beetroot rasam with steamed rice and dollop of ghee. Notes: Make sure beetroot is cooked well before blending. Suggestions: Make sure to adjust the tamarind according to taste. Variations: You can also add a tbsp of cooked and mashed toor dal to the rasam for taste. You can also add finely chopped tomatoes while boiling the beetroot rasam. Beetroot is chopped up and ground into paste before adding it to urad dal batter. Urad dal batter is prepared with urad dal and rice flour. 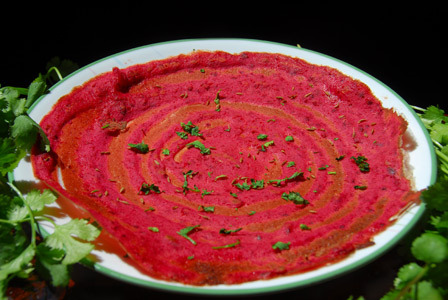 The beetroot dosa batter is made into thin dosa and cooked till crisp. Serve beetroot dosa with coconut chutney or with chutney of your choice or with sambar. Makes: 10 Beetroot Urad Dosas. Soak urad dal in water for around 3 hours. Refresh the urad dal in fresh water and grind it into fine paste adding enough water. Remove the urad dal onto a mixing bowl, add rice flour and salt. Mix everything thoroughly and keep covered in a dark place for 6 – 8 hours. Peel, remove ends, wash and roughly chop beetroot. Grind chopped beetroot, green chiles and salt into paste using a grinder. Mix the fermented dosa batter with ground beetroot mixture and keep aside. Heat a flat pan on medium – high heat. Pour a ladle full of beetroot dosa batter and spread with back of the ladle in circular motion into thin dosa. Layer the dosa with chopped cilantro and cumin seeds. Pour few drops of oil around the dosa and fry till it turns golden brown in color. Turn the dosa on other side, fry for couple more seconds and carefully remove the dosa from heat. Repeat the same with remaining beetroot dosa batter for more dosas. Also, store the dosa batter covered in a refrigerator for couple more days if required. Serve beetroot dosa with coconut chutney or with chutney of your choice or with sambar. Notes: Make sure the dosa is made thin else cook on other side for longer to crisp it up. Suggestions: Make sure to adjust the consistency of the dosa batter with water for thin dosa. Variations: You can also layer finely chopped onion on dosa along with cilantro. Check other dosa recipes here. Other Names: Beetroot Urad Dosa. Chana dal is boiled in water until its just cooked. Beetroot is chopped up and cooked in tempered oil along with green chiles. Boiled chana dal is finally added to the beetroot curry along with grated coconut. Serve beetroot with chana dal with steamed rice or wrapped in roti. Makes: around 2 Servings of Beetroot Curry with Chana Dal. Peel, remove ends and wash the beetroot. Chop up the beetroot into small cubes. Bring to boil around a cup of water, add chana dal. Boil till chana dal is transparent and just cooked while still holding its shape. When mustard seeds start spluttering, add green chiles, beetroot pieces and salt. Uncover, add boiled chana dal and cook covered for another minute. Finally stir in grated coconut and remove from heat. Garnish with few boiled chana dal and grated coconut. 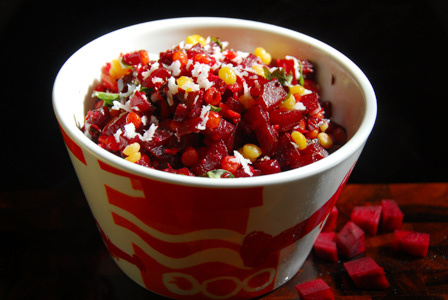 Serve beetroot curry with chana dal over plain steamed rice or wrapped in a roti. Suggestions: If the beetroot or chana dal is not cooked properly, add a splash of water and cook covered on low flame till done. Variations: You can also use moong dal in place of chana dal. Other Names: Beetroot Senagapappu Kura, Beetroot with Chana Dal.